Most of us instinctively know that much. What we often ignore, though, is the fact that kids brains are not only physically more fragile but mentally as well. Psychologists liken a child’s brain to soft, impressionable play-doh. Harsh words that Jimmy’s dad could shrug off might stay with his son for years. 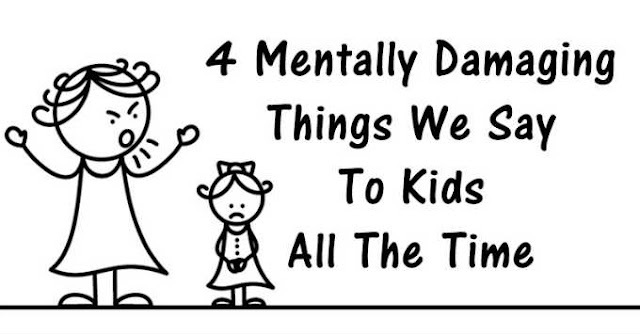 What follows is a list of 5 harmful phrases kids hear far too often. According to psychologists, many kids are simply born with a more finely tuned nervous system. As a result, they react quickly and intensely to just about everything. Parents of such kids often make the mistake of trying to wash that sensitivity out. Over time, this throws the child’s brainchemistry out of wack and reduces their ability to empathize with others. After all, if they’re taught that their emotions don’t matter, why would they think anyone else’s do? encourages parents to listen to and accept a child’s emotions, even if they don’t seem logical. That might be totally appropriate to say to a 25 year-old under the same circumstances. But a child’s brain is physicallyunable to grasp the fact that their experiences are not unique. When you tell them that, they’ll feel guilty, frustrated and confused. That is a terrible response. It tends to build resentment in children because it forces them to accept a dogmatic belief. This will inevitably lead to a power struggle when that child learns to come up with answers on their own that question their parents’ authority. Instead, as frustrating as it might be, why not just answer the question? I mean, your parenting decisions are based on logic – why not share that with your child? It will help them understand that, sometimes, authority really does know best. That reason is likely that you’re overwhelmed. It happens. Your kid won’t stop singing Justin Bieber and it’s really frustrating. But instead of telling them to shut up, why not explain that – hey, mommy had a long day and she’d really appreciate some quiet? Want to learn about more phrases to avoid saying to your kid? Check out this video!